The Whole Horse newsletter, Issue #017-- What Does Dressage Mean? Olympic Dressage could be reasonably expected to include the highest quality horse and rider combinations that exist. This is already a complicated distinction to make when dressage itself is a term which means different things to different people. If it is defined as a sport however, it must have rules laid down in black and white. The very fact that beauty and truth can never be defined in black and white is the fundamental problem with competitive dressage. Any requirements laid down for a competition will be striven for no matter what. Some sports encourage beautiful performances - whether by accident or design - and continue to develop in this way in spite of attacks on their integrity through cheating or drug-taking etc. On the other hand there are sports which fall prey to the inherent greed and egoism which is the dark side of competition, and their beauty becomes a caricature. Has Dressage gone this way? Sadly we believe that it has, for a variety of reasons. The first reason, as mentioned previously, is that Dressage when judged as a competition is subjective i.e. its quality is assessed by current opinion. That would mean that Show Jumping, with it's fault system that is obvious for anyone to see, ought to encourage the best riding skill - but this is not the case either. Why? because of the second reason: all equestrian sports involve another living being, not just ourselves. In the last twenty years dressage competition horses have changed to an astonishing degree. They have an inherent suppleness and uphill physiology which simply did not exist in the past. 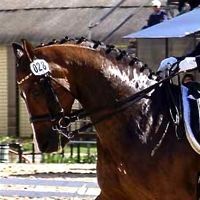 This has become a problem because dressage training was founded on the process of suppling and straightening a horse in order that the horse could then carry a rider in a balance which allowed him to perform certain movements. 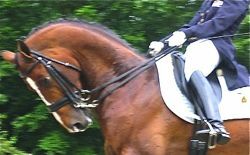 Modern dressage horses are straighter to some extent than their ancestors, but the difference is primarily in their uphill (already skeletally balanced) conformation, and particularly significantly in the suppleness of their joints. This suppleness is so influential that most Grand Prix horses have obvious crookedness through their bodies yet they can still perform the advanced movements. Producing these wonderful horses has backfired in terms of the quality of competitive dressage, because a short-cut now exists to fulfilling the rules and requirements, but along the way the original point of the rules and requirements has been forgotten. The point of course being that training a horse to move in self-carriage makes him or her beautiful and inspiring to behold. This brings up the ultimate problem. Having lost the necessity of the systematically correct training process, the belief in the existence of the independent seat has also been lost, and riders therefore no longer sit with the horses movement, but above it, because they are balancing themselves on the reins, water-skiing on the reins and driving the horse into the severity of the double bridle with the unsympathetic spur. This is exacerbated by the modern dressage horse's phenomenal suspension and naturally large stride. Where does Rollkür fit into this picture? It is quite possible that horses would not be so apparently consistent and precise if they were trained in true self-carriage, and if true mutual responsibility actually existed in these tests. 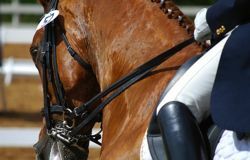 In this case the requirements might have to be altered to preserve the beauty which comes from mutual consent, and the criteria used by dressage judges to define correct work would certainly have to change. Three ordinary horses working in self-carriage and engagement. The fulcrum of balance between horse and rider is in the seat and leg not in the rein contact. Training a horse to carry himself starts right at the beginning. If we put side-reins on which do not allow a young horse to stretch his neck down and forward, we have already begun the process of putting the fulcrum in the rein. Horses must be allowed and encouraged to balance their own body, introduced to bending around the circle and containing their own movement from the very beginning - without a rider. Without a rider because a young horse needs to strengthen his musculoskeletal system considerably before he can lift a rider in a healthy way. Mounting up too soon simply sets up hollowing patterns which are virtually impossible to resolve completely. 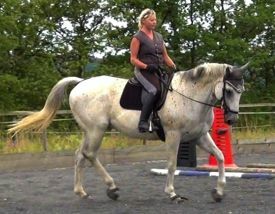 By the time we get on, the young horse is already habituated to controlling his own forward movement to a large degree and we never need to start relying on the reins. Of course training ourselves to sit to the movement without reins is also crucial! The importance of establishing a horse's training in the right way on the ground is why the first e-book on training/riding we have released on HHT is on this particular subject. So many problems and difficulties under saddle can be avoided by strengthening the horse in the right way on the lunge - establishing bend, balance and longitudinal stretching - and by forming the correct yielding response through in-hand work. 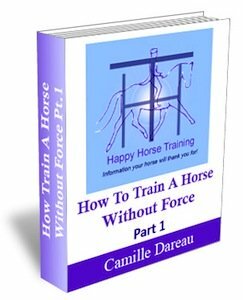 Training A Horse Without Force is a detailed guide on how to create these solid training foundations, as well as being a profound exploration of how to create a relationship of mutual trust with your horse. These are some exercises to determine where the fulcrum of your balance lies when you ride. Is it in your seat or in your rein? 1) Put your horse out on the lunge with no attachments other than the lunge line, preferably not clipped onto the bit but onto the nose-ring of a cavesson/Micklem bridle. If your horse has been used to lifting his/her back nicely when you ride, he will form a nice parabola with his body, stretching down without restraint. Of course every conceivable type of horse and rider exist, and horses with a history of being ridden on the bit may return to the hollowing reflex. 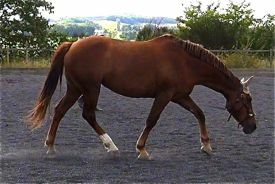 Horses with physical restrictions in their back and neck may also have difficulty, but if you are genuinely succeeding in your training towards self-carriage, it will become evident during the lunging session, because if it is there when you are in the saddle, it will also be there when you aren't. 2) Check that when you ride in a snaffle and without spurs, your horse is still forward-going and happy to relax his/her jaw when you sit into the movement. 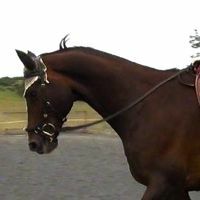 Relying on a double bridle to produce flexion in the jaw, and spurs to create forward movement are signs that the horse is not engaging into self-carriage but being driven into a wall in front. 3) When bringing your horse into the contact see if he/she will soften onto the bend and in the neck before you shorten the reins. Usually this will indicate that you are not using the rein pressure to compress your horse into a shape. Be aware that horses which have been trained in auxiliary aids, or with a heavy rein contact are sometimes conditioned to round up their necks at the slightest pressure from the rider. The way to tell if this is the case is by the shape of the horses neck: if it rounds up like a tyre, rather than telescoping forwards, and there seems to be a sense of rubberiness about the neck muscles then there may be a false neck carriage. The photos below illustrate how to recognize a compressed neck and a telescoping neck. The head carriage offered by the horse as a result of true engagement (photo, right) is characterised by a U-shape under the gullet, instead of the V-shape of the forced head position (photo, left). The mouth of the horse in correct balance is relaxed and never needs to be held shut by a tight noseband, and the eye should also show relaxation instead of either tension or blank dissociation. If you enjoy Happy Horse Training and you find the information on the site useful, please help us to share it by clicking on the Facebook 'like' buttons (if you have a fb account) that are on each page, and sharing the site/page to your wall. Any other way you can pass the site on to friends and colleagues, for example via discussion forums, is of course also greatly appreciated. Happy Horse Training now has over 100 pages exploring different areas of holistic equitation. Do have a look through our site plan to find subjects that interest you.